The parts have arrived and tear down has begun. 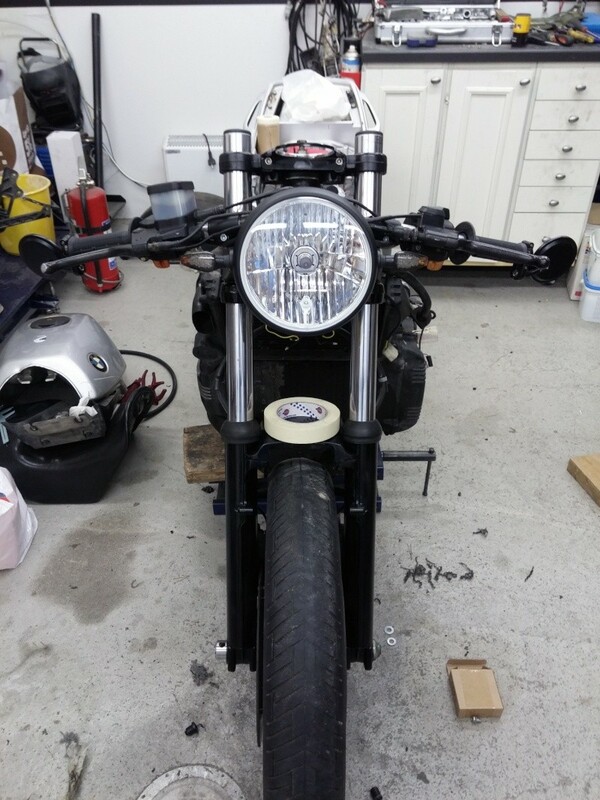 Parts ordered so far are as follows; Koso North America Tach/Speedo, Woodrich Clip Ons, 7" Round Halogen Light with mounting brackets, new LED blinkers, and a radiator cover for a naked k75 I am still waiting on bar end mirrors and tail light. 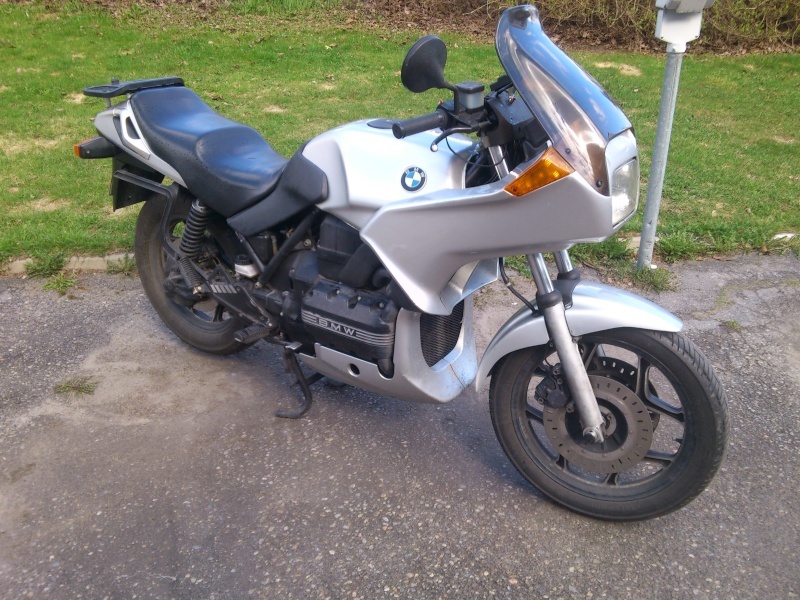 A 1987 BMW K75S in silver, its a good runner and in good shape for its age. 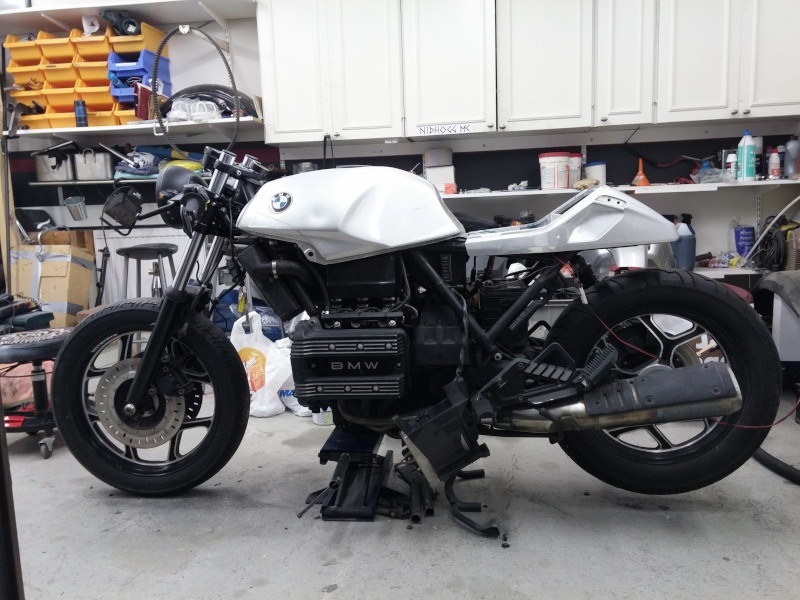 The idea with this build is not to scare away all those K lovers, I am aiming for a style that could have been a factory option for BMW. The results will tell if I achieve this. I have some parts that will be up for sale for those looking for K75S parts but that I will post in another topic. Looks like a good bike to start from, good luck with your build. 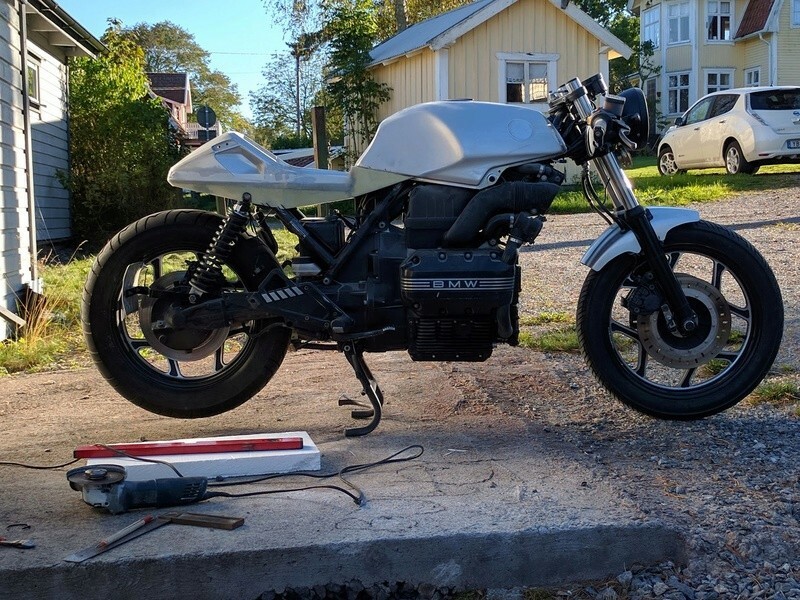 Good luck with your projectbike; I'll follow your postings with interest ! Well progress has been a bit slow with the renovation, too much work and not enough fun. 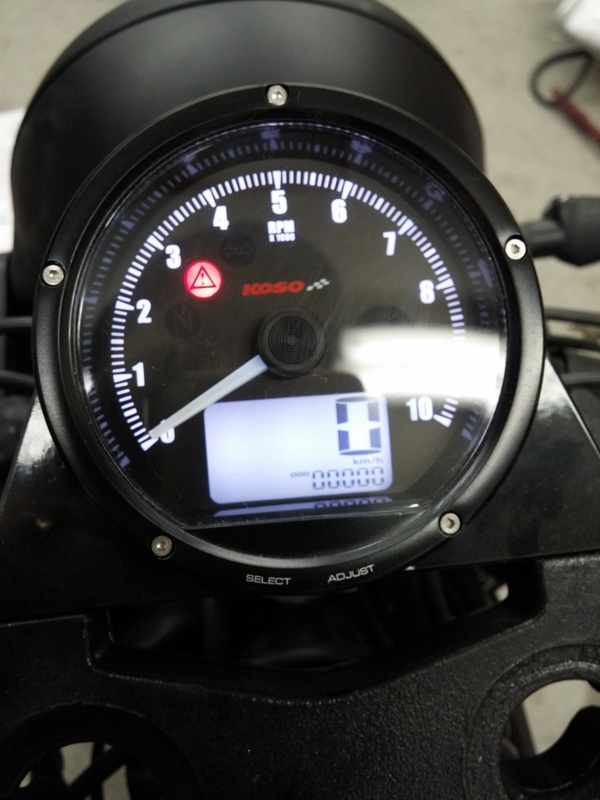 Today I was able to work on the adapter for the new Koso speedo, drew it up and and milled it out on the CNC. It will attach to the front of the top triple tree. Here are some pictures for now. More to come. That looks good. 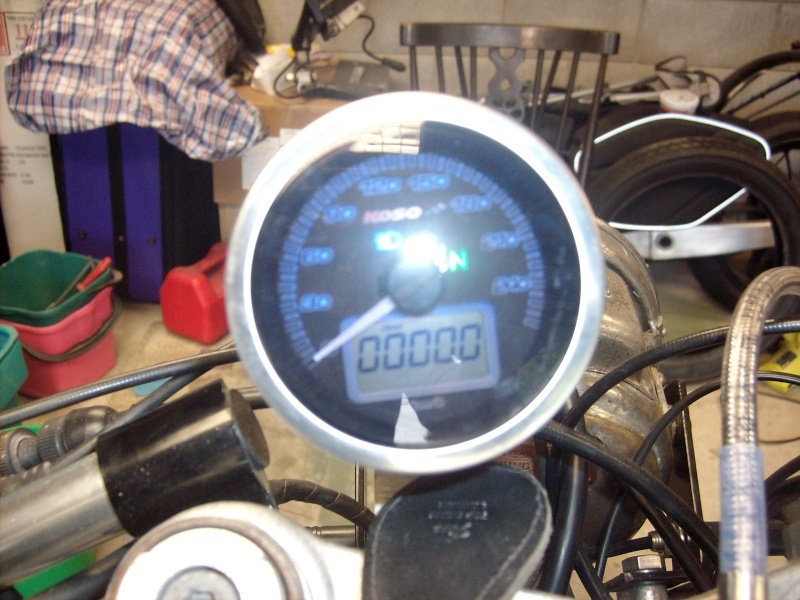 I have a koso speedo also but had to mount it one side to avoid the brake line. What were you thinking of doing with the top triple tree? @WoodyAUK75 wrote: What were you thinking of doing with the top triple tree? Have the key in the left handle mount hole. I think ill get a usb port clock in the rt. 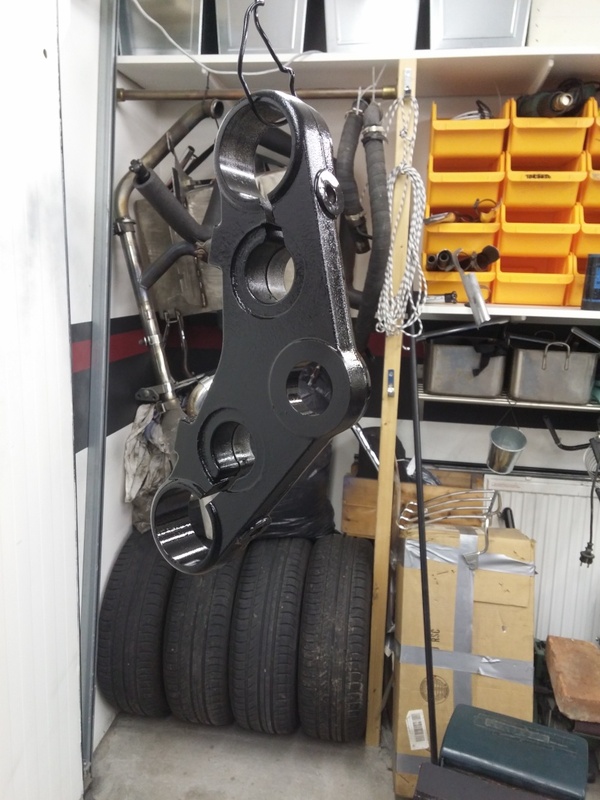 I have seen sets for Harleys that rake the front end out. Wish I still had access to a mill, I'd like to give it a go. 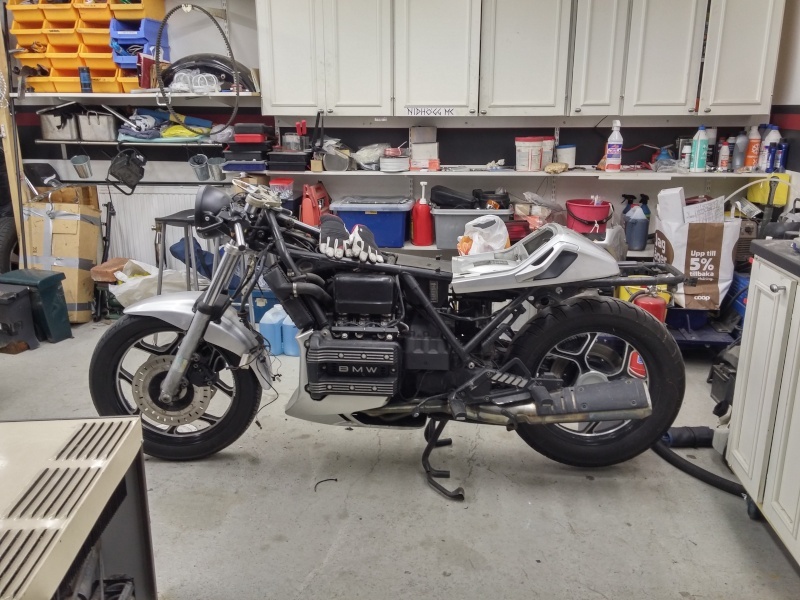 I'm changing the k75 triple tree out for one from a k100 so I can mount the ignition in the tree and maybe even fit a gear indicator in the other. 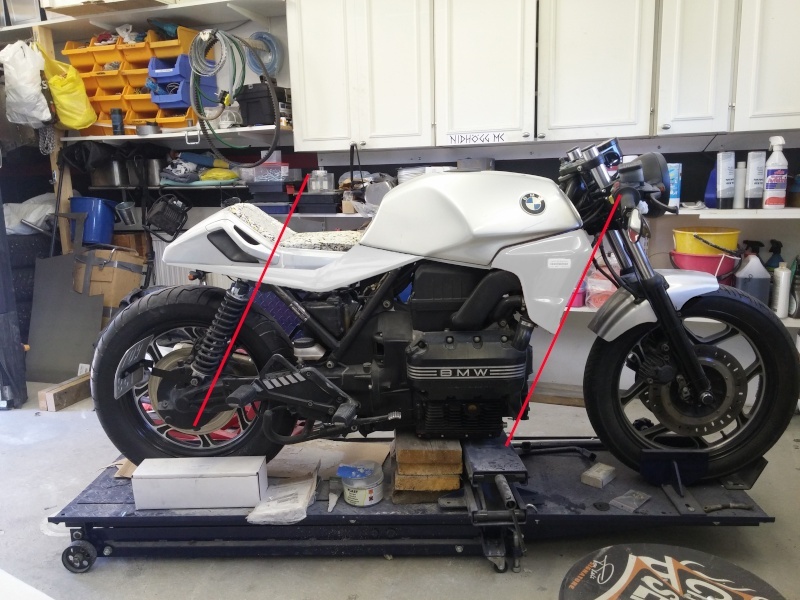 This will mount on the front where the fairing brace attached before. 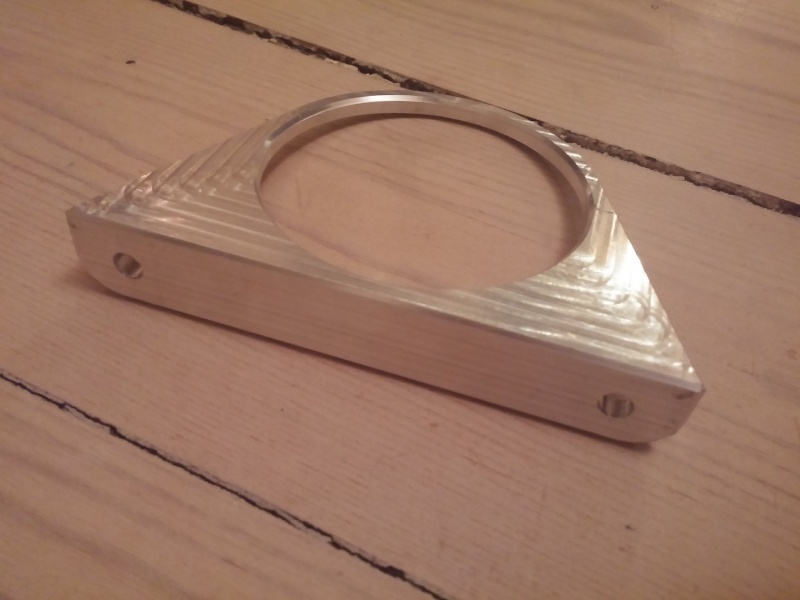 It is quite convenient to a CNC available, all i have to do is decide what I want and how it will look then I can go at it. Short update, more disassembly yesterday and test fitting of parts. 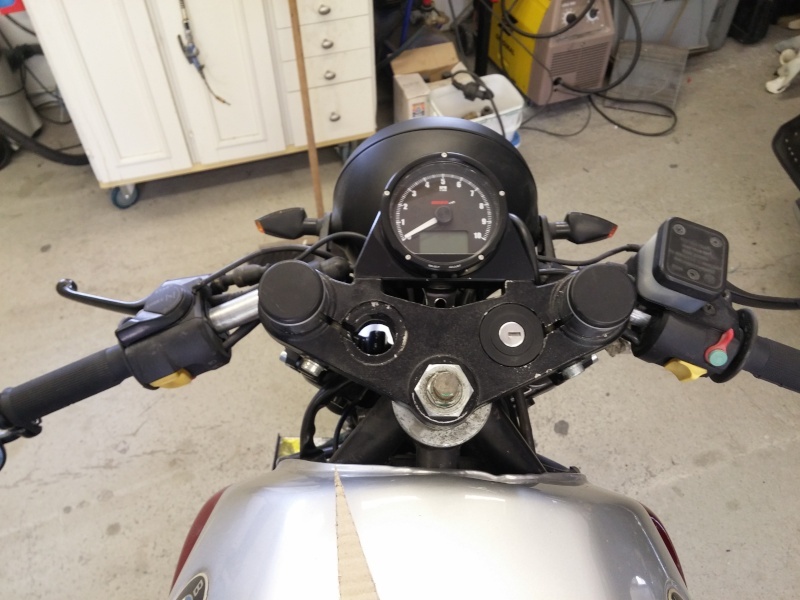 Had to hone the controls to fit the clip-ons, now they fit great! Also note that the upper triple from a 1985 K100 fit my 87 k75s for those of you who may want to do this conversion. 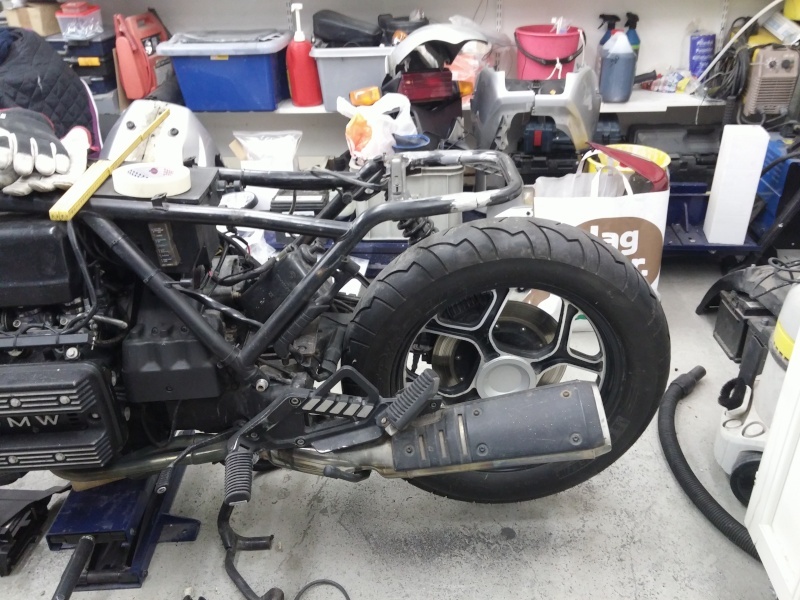 Next is to disassemble some parts for paint and decide how much to shorten the frame... Regarding the plastic tail, is there anyone here with experience of sectioning plastic? I need to narrow the tail which requires splitting gluing and some smoothing, tips are appreciated. Here are some pictures for now. 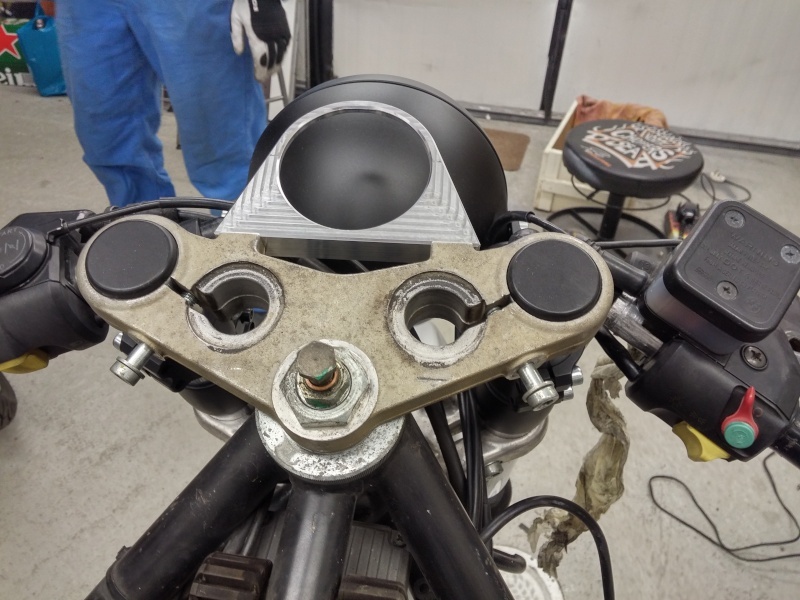 Modified my speedo mount to properly fit the speedo...why would i modify a specially designed mount you ask? Well I recommend checking the actual size of the gauge and not rely on their measurements (5mm difference) but now it fits! 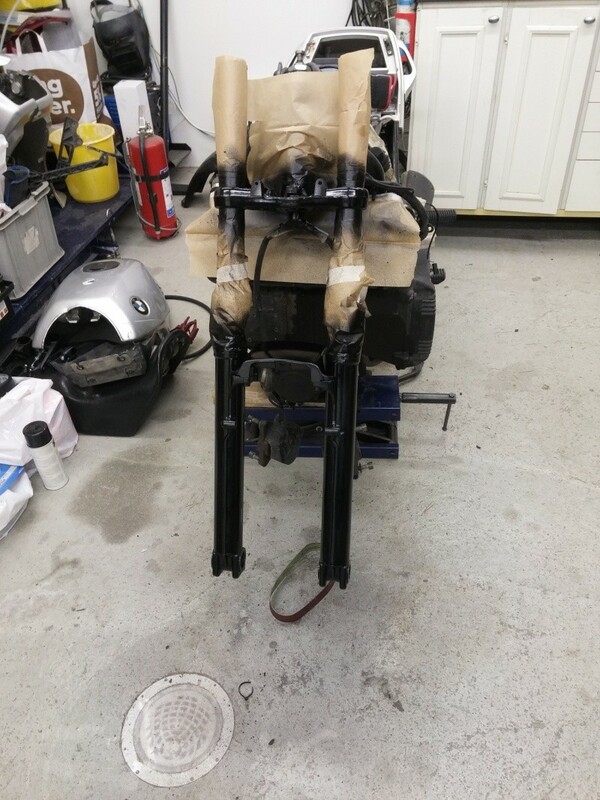 Next was disassembly of the front end for paint, (previous owner badly painted the forks silver with a brush...) so everything got a new coat of black. 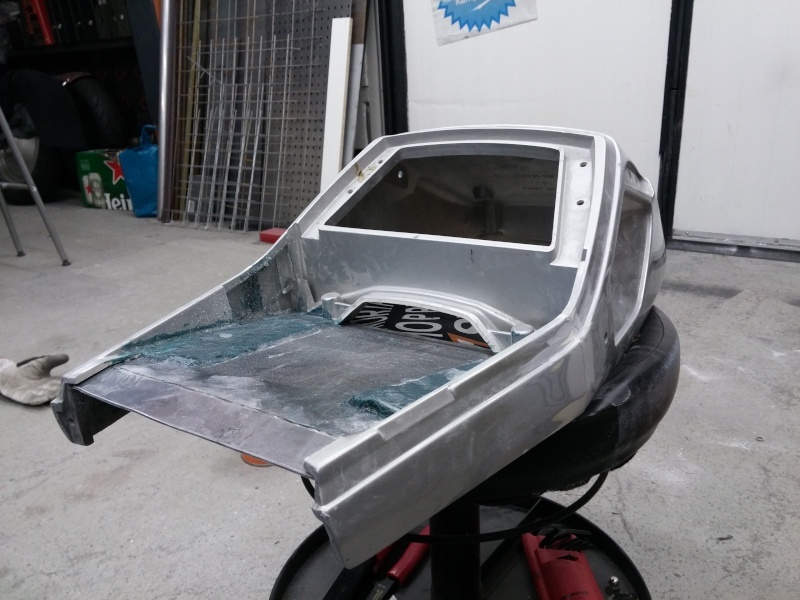 Today was a slow day with reassembly of the front end. Wiring was a no go without new connectors which I forgot to buy...oops. 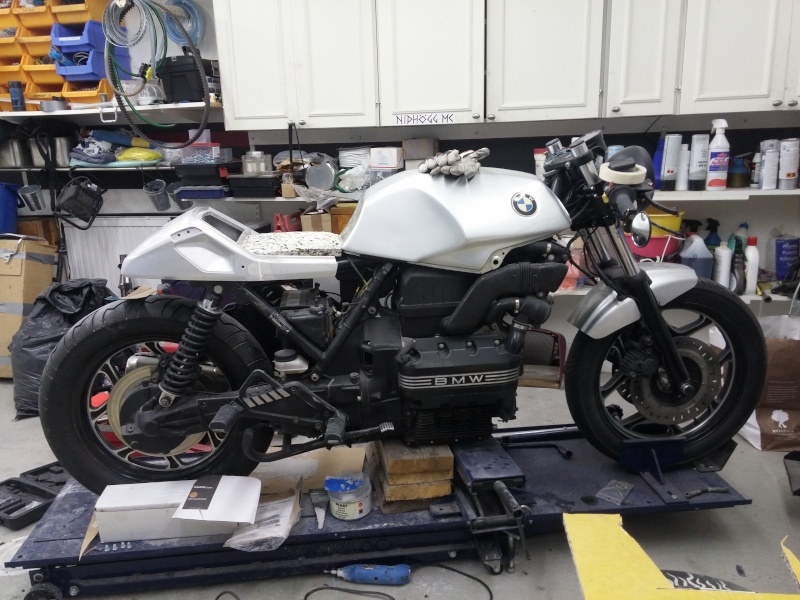 So the wheel went back on after painting the front end along with the brakes, raised the forks, new blinkers, clip-ons, grips, speedo, and bar end mirrors. 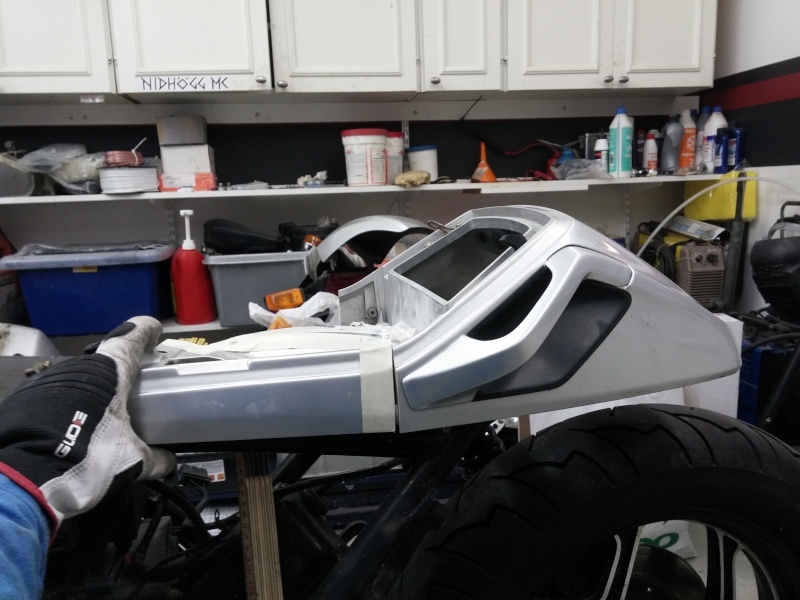 Today was hack day, the frame got shorter and the rear cowl narrower. Quite happy with the results just need to check clearance tomorrow. Removed the back loop and checking for alignment and distance. Re-welding of the back loop after tab removal and shortening. A little black paint to finish it off, tabs need to be made for the rear light, rear cowl etc. 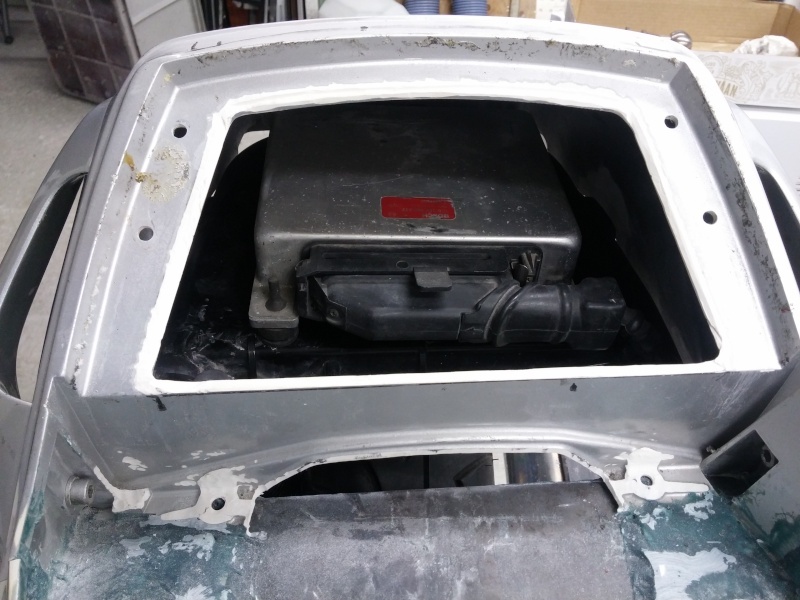 Modification to the rear cowl, same width in the back but the side bits were removed and are almost ready for re-attachment at a new angle. 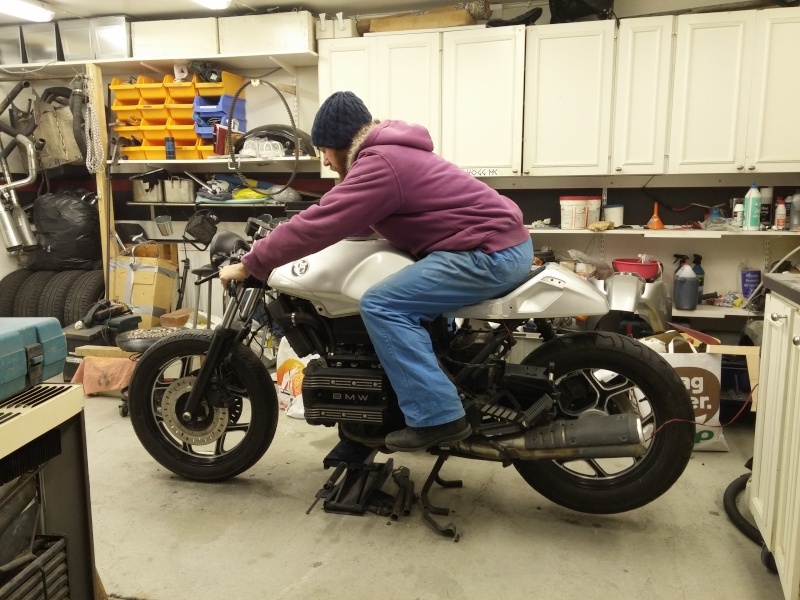 That's nice Zach - it's the treatment of the line between the tank and the cowl that make most cafe style bikes look off. Watching with interest. 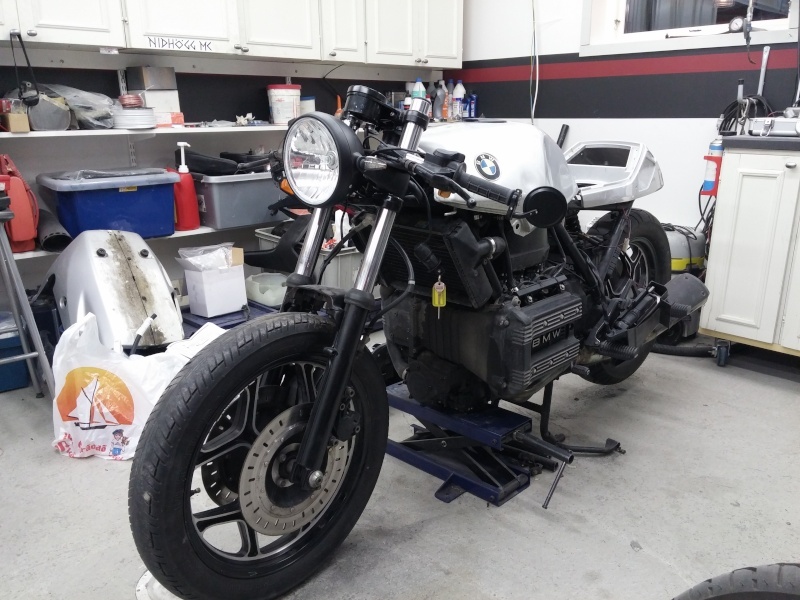 The last days, only a couple days left until I resume life as normal, it has been nice to make some real progress on the bike this last week. 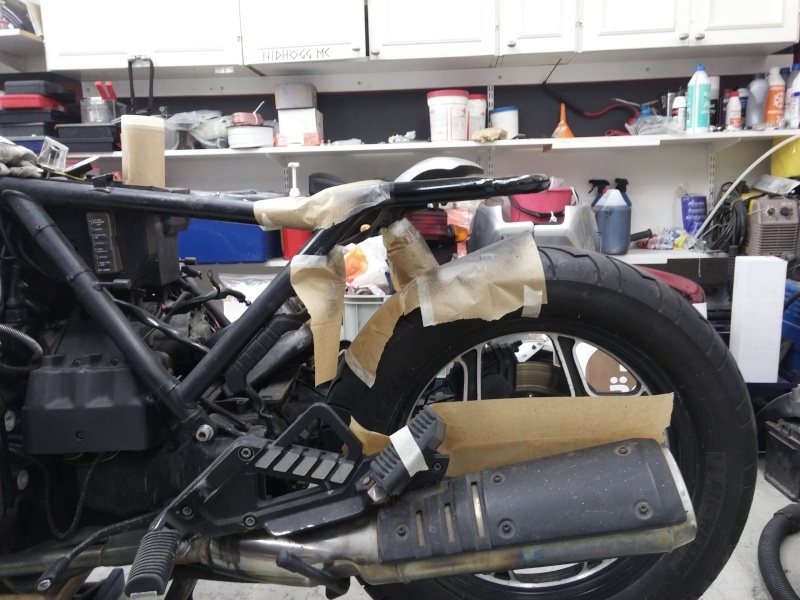 Today started off with some reinforcements for the modified cowl followed by some plastic puddy to fill the gaps that were created from the new angle on the seat. Yesterday I started with what I am worst at Electrics... I must admit that it went better than I could have imagined actually. 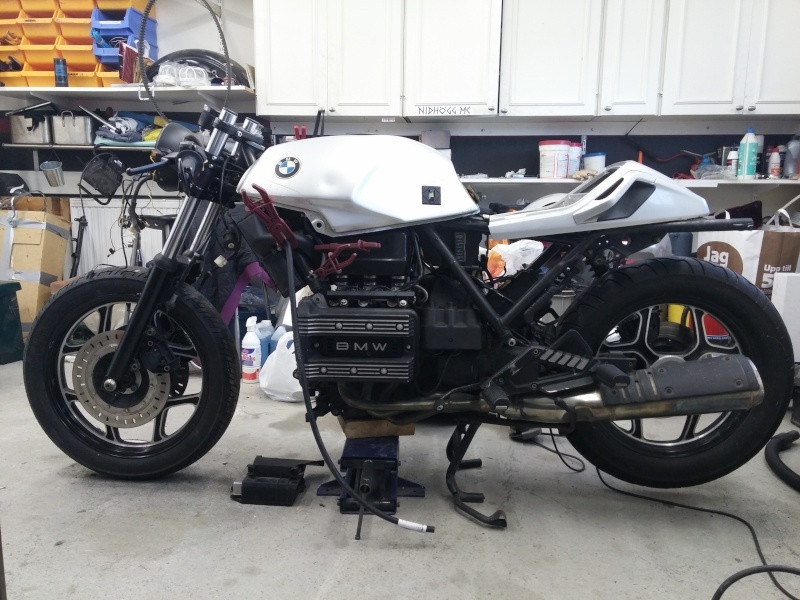 So everything was working yesterday besides the tach(wasn't hooked up), and the blinkers which need a resistor. Today I hooked up the tach(after much confusion and multiple ideas) to the original wire from the old cluster and it worked to my suprise. 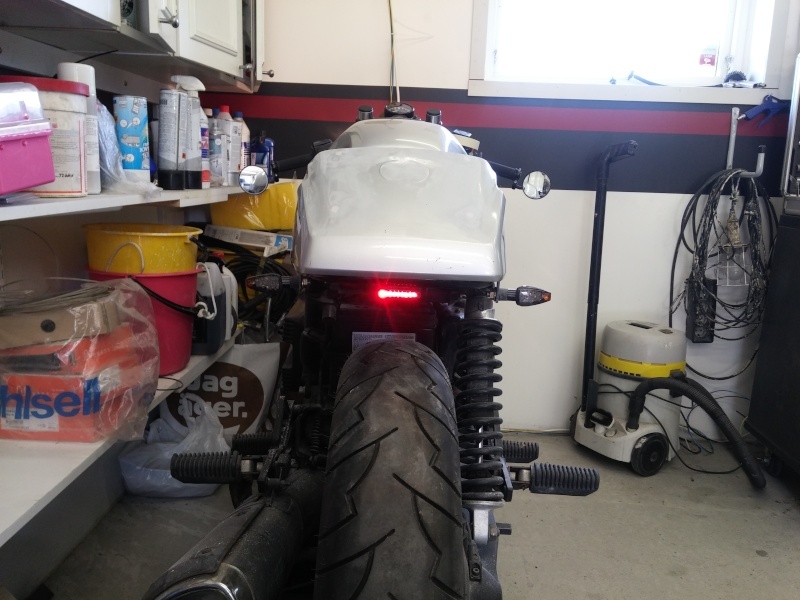 Question for those of you electrical genius' out there, besides resistors for the new led blinkers what else do I need to take into conisderation after converting to LEDs and a new speedo? I heard something about a resistor to make the alternator work(more info appreciated) is there anything else I need to do so the bike works as it did before the modifications? 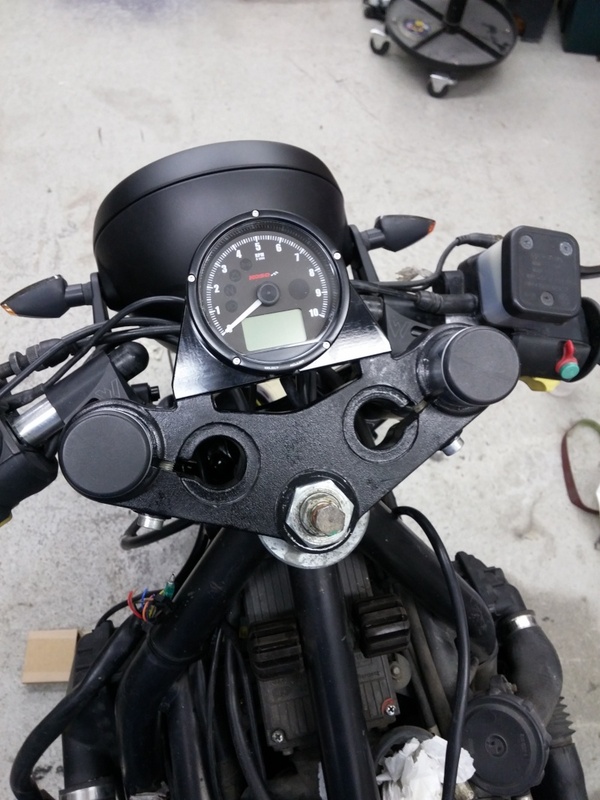 I even started the bike today after all the modifications, works like a charm tach seems good, speedo too, along with blinkers indicator, oil pressure warning light, high beams and even the fuel indicator although I do have a question about that. 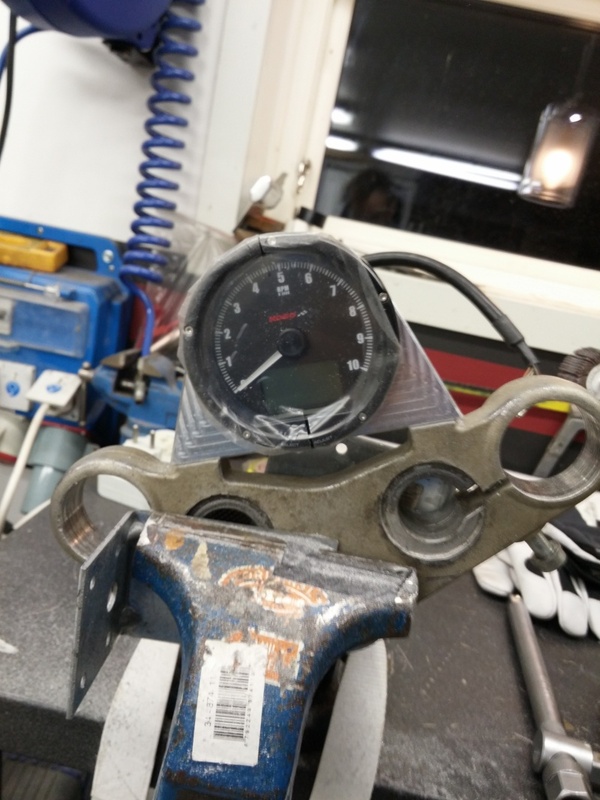 The Koso gauge that I am using is asking about resistance for the fuel sensor, what should I program in? I'm given choices between 100, 250, 510 1200ohms. Tips? All other tips and tricks are appreciated. Charge warning lamp, post 5. @Inge K. wrote: Charge warning lamp, post 5. Do I need to add some sort of resistor for the alternator? You need to feed +12V to the rotor windings to excite it so that the magnetic field is setup in the stator windings and the alternator begins to work. Some people have had pure luck getting their alternators to fire up without this exicter circuit, but it is hit-and-miss. Using two 56 Ohm, 2 Watt resistors in series with the rotor will limit current to about 300 mA. A 4W bulb will do the same as well as provide a visual indicator when the charging is not being performed. 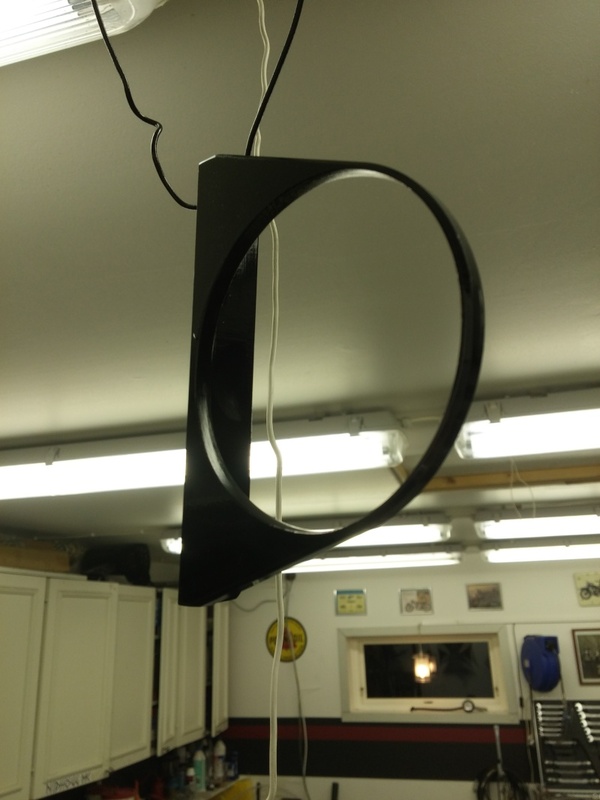 It is also possible to replace the bulb with a LED. 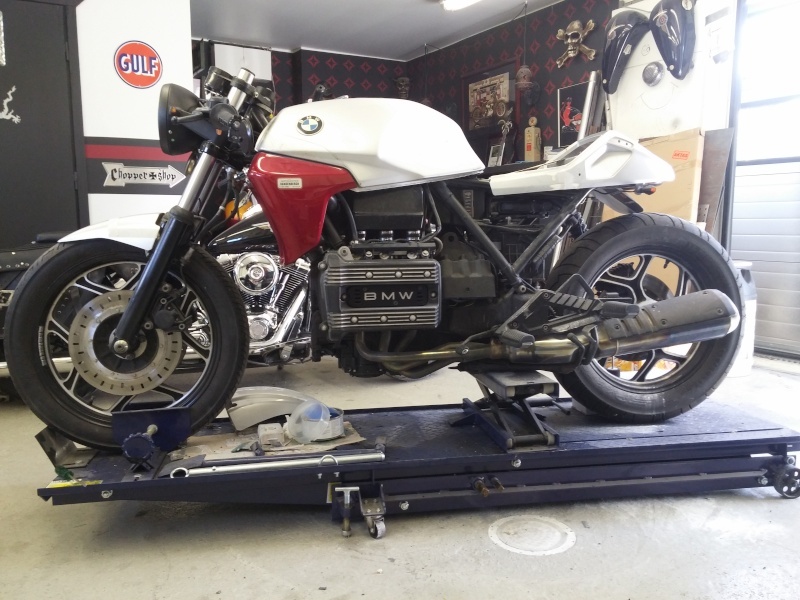 Was able to work on the bike again this weekend, after a long period off. 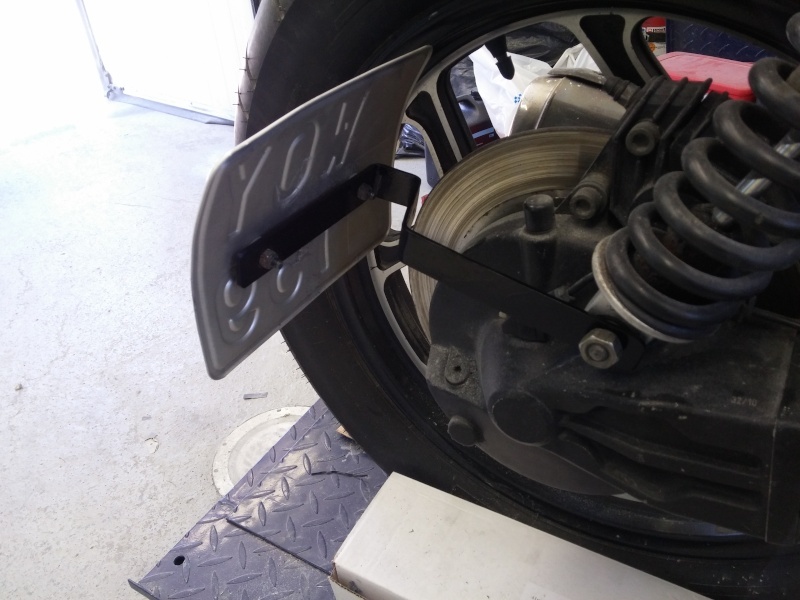 (having a kid isn't productive for modifying a motorcycle) Made some small adjustments to the bike and brackets to attach the tail. Question for all you who know so much. If i want to keep the coolant overheat light what do i need to do to make it work? Is it just a led between purple/black and ground? Or do i need some resistors and a similar solution as the charge indicator? Wiring isn't my strong point. Found a nice spot for the ignition. there is a temperature sensor relay in the relay box ...this gets the temp from one half of the sensor and turns on the fan ...but also outputs to the lamp in the instruments ...it wouldn't be hard to incorporate that then ... have a look at the interactive electrical wiring diagrams for the right coloured lead ?!! looks like purple black .. The over-temp light is illuminated through the Purple/black wire as stated, but the signal is grounded. So a LED between that wire and ground will not work. You'll have to connect the LED to +12V OR invert the signal via a small signal transistor or relay if you want to insist on keeping one side of the LED grounded. @robmack wrote: The over-temp light is illuminated through the Purple/black wire as stated, but the signal is grounded. So a LED between that wire and ground will not work. You'll have to connect the LED to +12V OR invert the signal via a small signal transistor or relay if you want to insist on keeping one side of the LED grounded. As given my limited knowledge with wiring could you make a little sketch of how this would wire up? Those woodrich clip ons, did you use shims to bolt them to the forks? 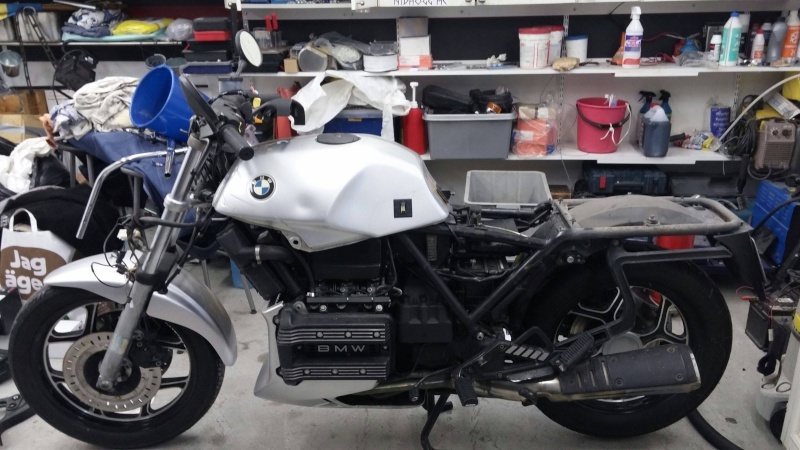 If so, where did you get them and that cowl under the gas tank, will one of those fit on my K100RT? @zach_ross wrote: As given my limited knowledge with wiring could you make a little sketch of how this would wire up? @Nantucket_Red wrote: Those woodrich clip ons, did you use shims to bolt them to the forks? 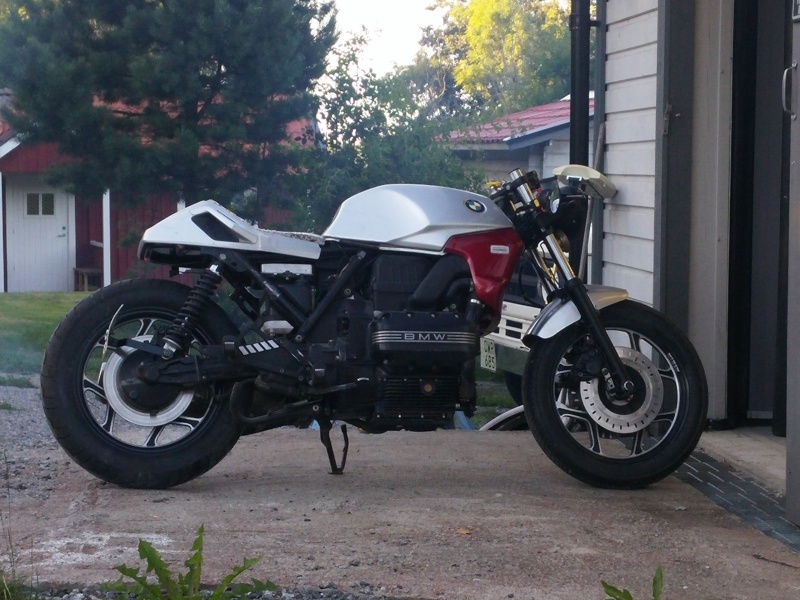 If so, where did you get them and that cowl under the gas tank, will one of those fit on my K100RT? You have two options for the clip-ons you can either machine them out or press them on. The clip ons are 41mm and the forks (for my year/model) are 41,3 make sure you check your year/model so you have the right dimensions. The cowl under the tank will not fit as it is designed for the k75 tank (another design as i understand it.) 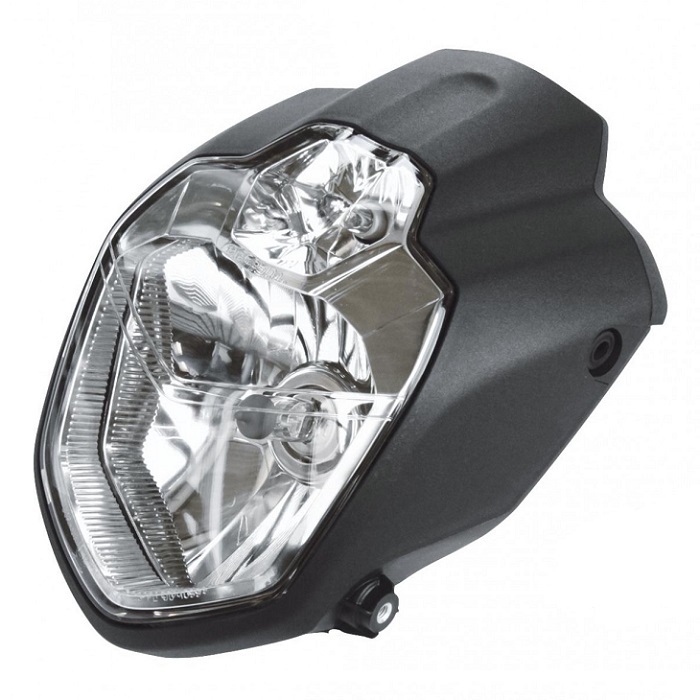 They do however have a similiar cowl for the k100 take a look here . Back after vacation and I had some time to fix with the bike. First I shortened up the fenders. 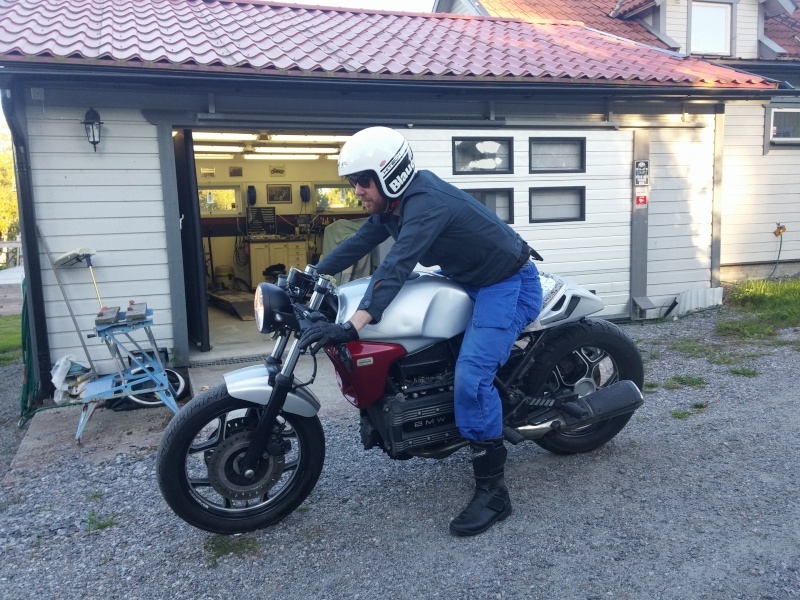 Now I have come to a point where I could test drive the bike again, and it goes like a dream. I have come to a major checkpoint and can use the bike as is while fixing the small things as I go. Got out to the garage this weekend and was able to fix a couple small things. 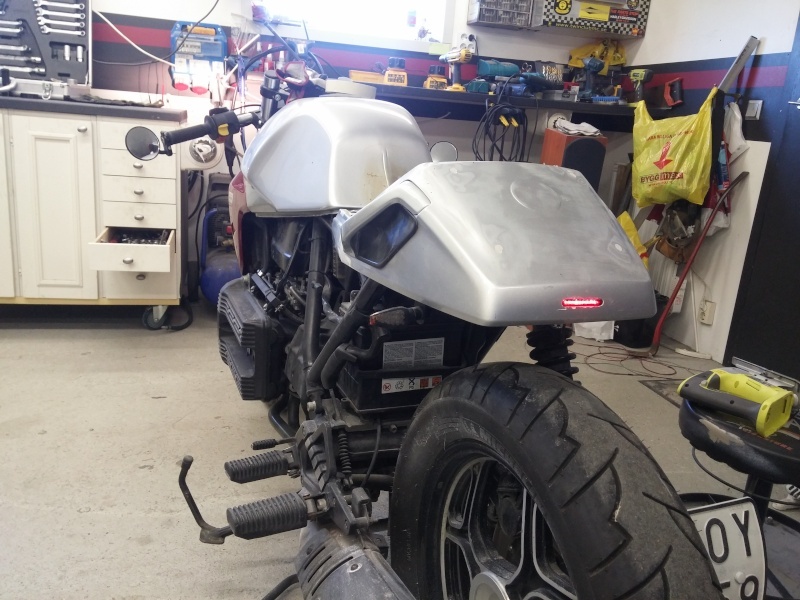 Managed to recess the brake light into the back cowl, move the ECU to under the back cowl, and added a light for the license plate. 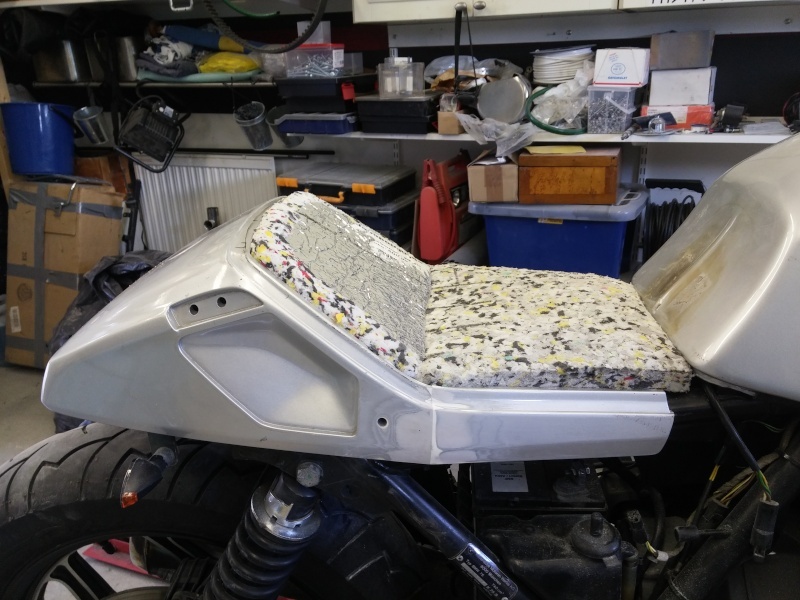 Quick fix and covered the seat, unsure about the comfort so it will do for now, if i'm not happy with it then not too much time wasted. Next step is to find a nice little battery to replace the huge one I have now. I am also working on a filler piece for between the tank and cowl, hopefully figure it out. I have also started sanding down the paint in preparation for paint. Unfortunately I haven't had so much time for working on the bike, have been messing around in Photoshop trying to figure out a solution for the side panels. I would love your help, which one do you like best? Nice work Zach she looks good, I prefer No 1 side panel option but whatever you choose its a job well done . looks a bit sleeker , will you be leaving the radiator shroud on, this could change the decision too. reminds me a bit of Bushys conversion. I like #1 and #2 but I do see the line of the tank on either doesn't continue into the side panel, It may look visually that little more appealing if the tank line flowed to the down tube of the frame then the side panel stayed at the front of the down tube. (you can tell I never learnt how to add little red lines to pics hey) and finished inline with the front of that down tube. Mate I hope this makes sense. #2 looks best to me. It would look better if the line of the bottom edge of the cowl is not horizontal but followed the line of the side cover. Thanks for all the help here comes another to look at, this is development on number 2 after your comments. I am not sure about the line on the last one, seems like the panel feels too skinny.. 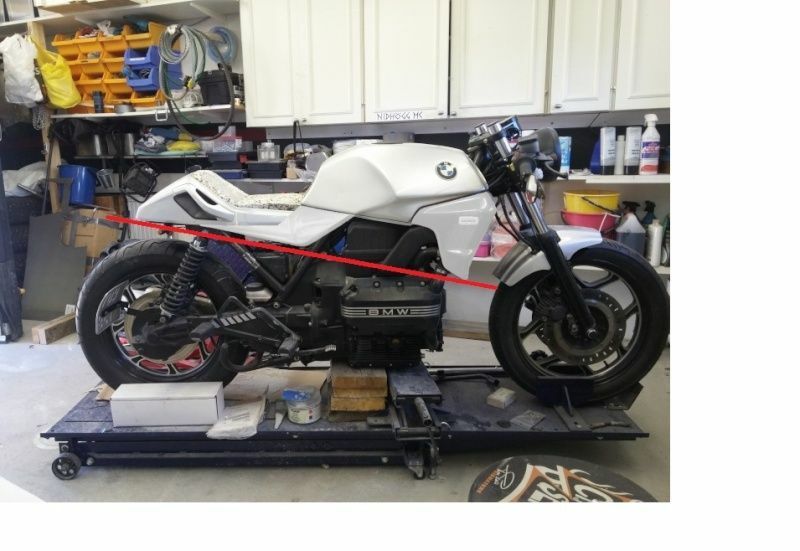 If you must café race a K, I think the latest modification looks the best, with the line as you've shown. The most awkward part is the line of the back of the tank, which would be a serious pain to modify. The way the top of the side cover follows the curve of the back of the tank is good, but if it had a contrasting pinstripe down the back of the tank and along the top front half of the side cover to accentuate the continuity of the curve it would look more integrated. Looks really good with the corrections. Like something the factory designers would do. With the many good lines in these bikes , I think this one looks best . 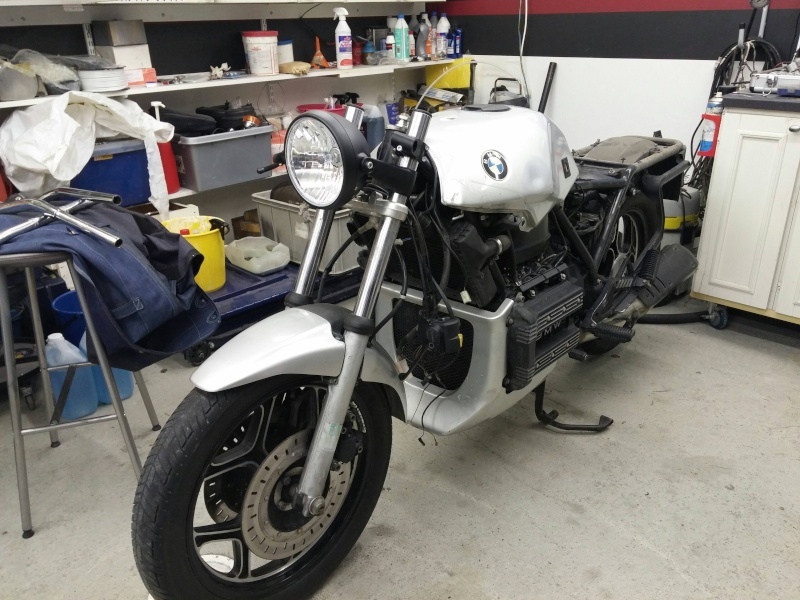 with a good set of tyres .... it will be one great bike. Thanks again for all feedback I really appreciate having a second opinion. Here comes another question for you, which color scheme do you like best, 1 or 2? It may be hard to see but number 1 is three stripes on the edge of the tank in grey scale, number 2 is one stripe in grey scale on each part. I like #2, as it has a slimming effect on the bulky K tank. Also the grey line at the back of the tank lines up with the side cover lower front line. I think I agree with Bill. I do like #1 but the stripes look a little thick when compared to #2 which covers just a little less area. Perhaps thinner lines may bring that appeal of three colours and not cover so much of the tank? #2 does look good on its own though. 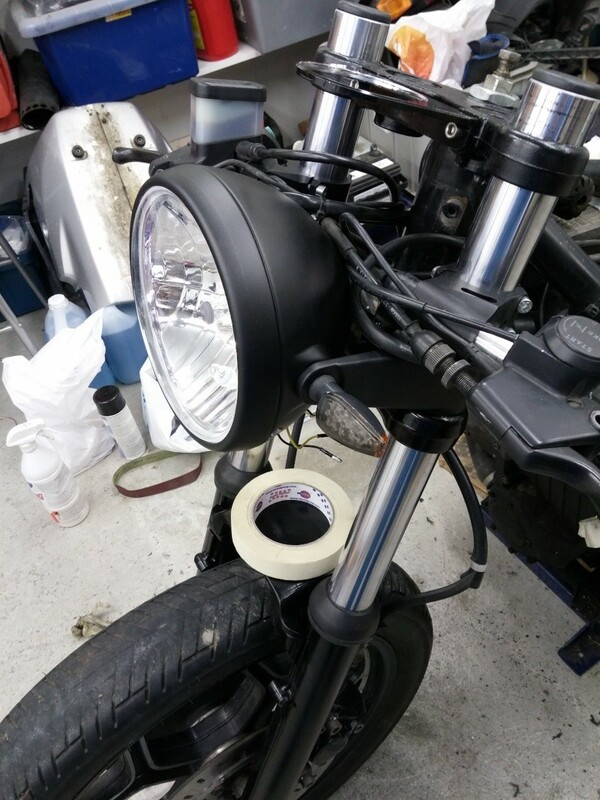 I have contemplated the headlight, I am not a big fan of projector headlights, but was thinking maybe a more angular headlight would look better with the overall style of the bike. Like the one you see on a MT-03. 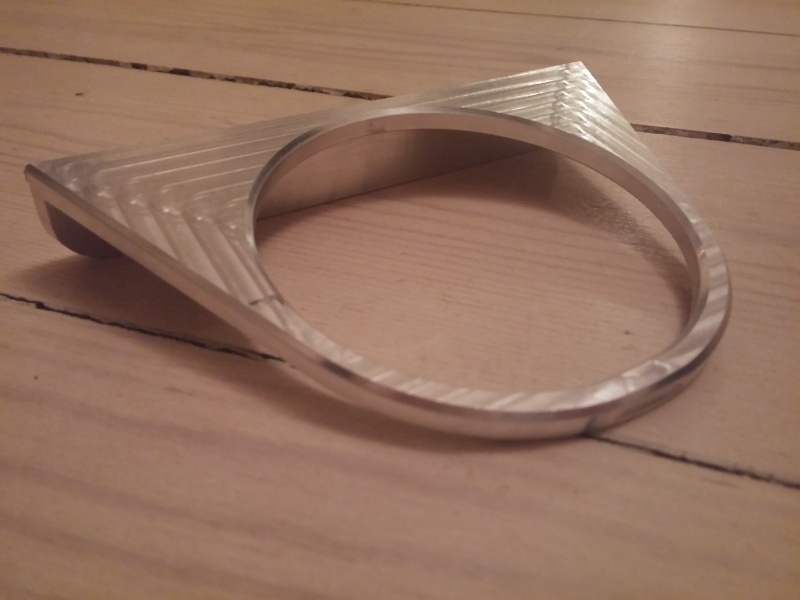 Here is a side shot of what it may look like, I think the overall look is much better, would have been better to know that before I bought and mounted the round one, but that's part of the process. 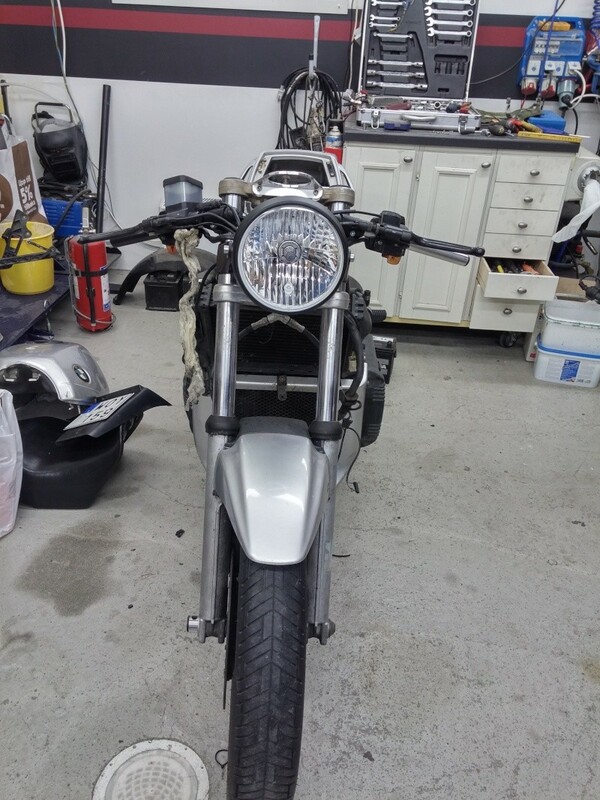 If you were sizing up a rectangle headlight, or twin headlights the old 1984 model Honda cbx750f had twin square headlights in a small handlebar fairing if memory serves me, they look good, even period friendly. The VF750 of that era had a single rectangle a tad smaller than the K's do. Yes, that headlight looks good, a little bit expensive. Maybe paint the headlight cover with glossy black will look even better. 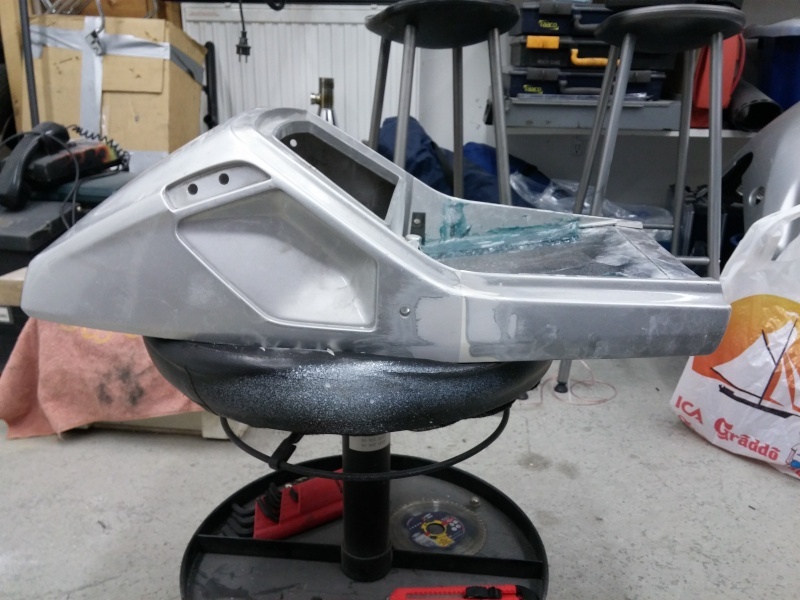 Time for an update, I have finally had time to start with the fiberglass on the rear fairing, this weekend was a bit of trial and error when it came to assembly, some modifications were made and some more fiberglass was added to the thin areas. I'm very happy with the results thus far and can't wait to see it in paint. More work will be done this week, hopefully have it together for a ride before the season ends. 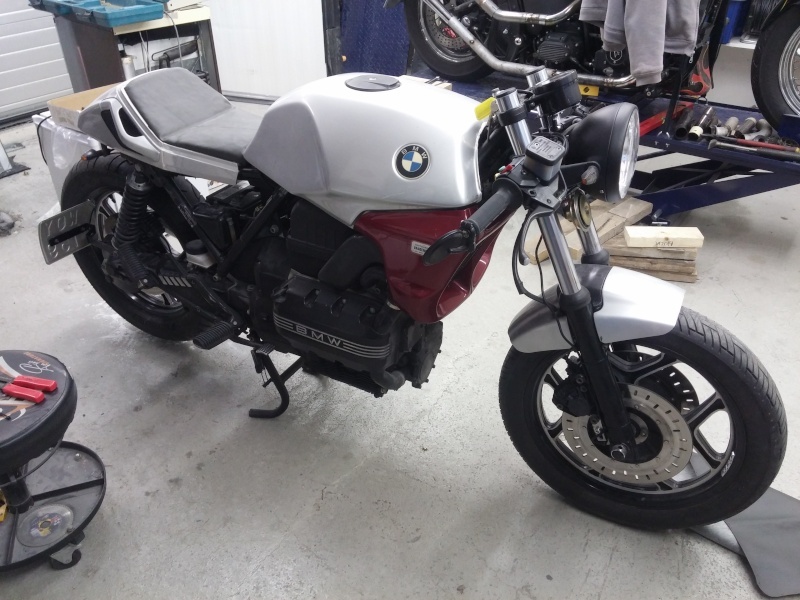 Looking very good, will be great to see it out on the road.